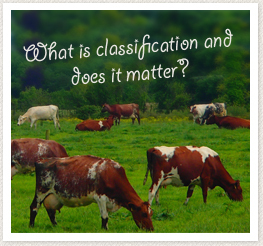 What is classification and does it matter? According to the Irish Holstein Freisian association classification is a scientifically designed system that describes the confirmation of an animal biologically on a scale of 1-9. It tries to give us a scalar picture of the animal without judgement. It is the road map for the breeder and dairy farmer in deciding on his sire selection as to the type of animal that suits his farming system. In classification an overall final score category is attributed to each animal eg. G (Good) 75-79 points, GP (Good Plus) 80-84 points, VG (Very Good) 85-89 points, Ex (Excellent) 90-97 points, based on confirmation. fying for years in Ireland. In 2012 the Irish dairy shorthorn members decided to come together and set up the Irish milking shorthorn club. This club has a core committee who asked it’s members what they wanted for the breeds development and classification was a popular request. Shorthorns in the U.K are being classified for years now so why not Ireland? We discovered that the Holstein classifiers were also in charge of scoring Jerseys. After investigation the agreed to take on the classification of Shorthorns because a good cow can be any colour. In September 2013 the three Irish classifiers attended a multi-breed workshop hosted by Holstein UK. Following this a workshop was held at James Lambes Ballytrain herd in Monaghan on September 25th. The aim of this workshop was to introduce shorthorn breeders to classification and allowed any queries and questions to be answered. Eg. “Does a cow need to be full of milk to be scored and at what stage of lactation should classification occur?” – A cow’s normal routine need not be interrupted; she can be scored with a full bag of milk or milked out and at any stage of lactation. This workshop was a good introduction for shorthorn breeders to the classification system. Since the end of September many shorthorn herds have been classified despite the majority of herds bring spring calving. Most cows may have been stale in the milking sense but scored quite well. The classifier was impressed with the standard of milking shorthorns he was seeing and commented that the cows surpassed his expectations and changed his opinion for the better on this red breed. The top scored Shorthorn was Ballinacregg Belle 3rd from John Fox’s Ballinacregg herd in County Galway scoring Ex 93 points.